Vieira de Sousa is a newly official Port house that dates back to the 18th century; as they have always farmed exceptional fruit from the Douro River region but used to sell the majority of their juice to larger estates nearby. As they have made small bits of Port for the family for over a century, the house now makes only their own Port as Luisa Vieira de Sousa Borges (the current and now operation generation of the family) completed a degree in oenology in 2008 and decided to take her family's business to a new level. In her young 30's, she is ambitious and is tackling a world of old traditional wine made by old men, by making incredible juice on her family's land. All estate fruit is used for the wines, coming from four different quintas (vineyards) at varying elevations, dispositions, and influences. In 2009 they bottled their first vintage Port from their top Quinta do Roncão Pequeno site, and the rest will now be history. In old stone lagares, they foot crush their fruit, let only the natural yeasts begin the fermentation, allow natural settling for clarification, and use incredibly delicate and quality brandy for fortification. Naturally, the final aged wines are exceptional, classic, and will be recognized as some of the greatest Ports available on the market. ​malvasia fina, rabigato, verdelho, etc. 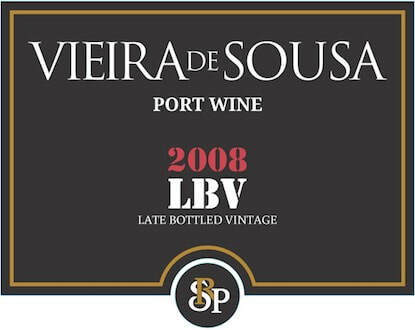 The Fine White Port is the entry-level example to the white style of Port that the Vieira de Sousa estate does better than anyone else. It has spent the least time in barrel, though still focusing on the oxidative element of the wonderful white grapes used, but perfect for a delicious cocktail, or still wonderful simply paired with food and desserts. The grapes are a very traditional blend of Malvasia Fina, Rabigato, Voisinho, and Gouveio, where the hand-harvested fruit was brought into the cellar for a foot-treading press in old granite lagares. It ferments in lagares with extended time on the skins, until it reaches the desired Baumé, (in this case 3.4). It was then fortified with Brandy to keep the sugar level and fruit flavor vivid and rich, aged in old wooden vats (a bit in stainless steel as well) to expose oxygen to the wine, developing rich nutty characteristics, elegance, and delicious flavors. The 10yr White Port is a highly aromatic and complex wine that takes advantage of prolonged skin contact and an oxidative process of a long time in oak barrels, in order to create a remarkable treat from the local white varietals. A field blend of Malvasia Fina, Rabigato, Verdelho, and Gouveio come into the cellar after a hand-harvest on steeply sloped sites, for an old-fashioned foot crushing in giant concrete lagares to begin fermentation. Once fortified with grape brandy and then moved to large and old oak vats, the wine rests for many years, and the final bottling is a blend of vintages that average to at least ten years. The brilliant gold that shines forth from the glass is packed with a raisined and nutty aroma, leading to a sweet and fresh palate of fig, golden raisin, ginger, and pear. An incredible structure with acidity and weight, this wine pairs perfectly with creamy cheeses, thick chutneys, and nuts. touriga nacional, tinta roriz, etc. The Late Bottle Vintagae was destined for vintage Port yet continued its aging longer than the maximum three years allowed and was bottled after its fifth year of aging. A hand-harvested blend of Touriga Nacional, Touriga Francesca, Tinta Cão, and Tinta Roriz, was brought to the cellar for an old-fashioned foot crushing in large concrete lagares to begin a natural fermentation. When halted by fortifying with grape brandy, the wine was moved to large and old oak vats for aging before bottling. This LBV is dark ruby in color and shows concentrated qualities of red and black fruit, with spicy pepper and dark chocolaty goodness. Very smooth tannins and an overall balance on the palate makes this extra aged vintage specific Port a remarkable choice for pairing with strong cheese, chutneys and nuts. The Fine Tawny Port is a wonderful delicious example of the ‘Tawny Style’ in the region, from the Vieira de Sousa estate. The aging is done in large old vats (tonel) to encourage an oxidative environment for this deliciously nutty Port. This is a very traditional blend of Touriga Nacional, Touriga Francesa (Franca), Tinto Cão, Tinta Roriz, where the hand-harvested fruit was brought into the cellar for a foot-treading press in old granite lagares. It ferments in lagares until it reaches the desired Baumé, which is the measure of sugar that gives the potential alcohol point for Port (in this case 3.3). It was then fortified with Brandy to keep the sugar level and fruit flavor vivid and rich, and then put into oak vats for aging for many years. The final tawny offers a rich palate that is very balanced and elegant, with nuts and caramel notes, dates and figs, and a long expressive finish. The 10 year old Tawny is a gorgeous example of the estate’s beautifully complex grapes after going through traditional practices and aging. A field blend of native varietals such as Touriga Nacional, Touriga Francesa, Tinta Cão, and Tinta Roriz, are handpicked and brought into the cellar, and then placed into old traditional stone lagares for an old-fashioned foot pressing and fermentation. When the process is halted by fortification with grape brandy, the wine is placed into a combination of different large and old oak casks for many years, with the bottled wine having an average of 10 year aged Port in it. The aromas are intense and heady, with dried fruits, figs, nuts, and plum, leading to a silky and soft texture on the palate with stewed fruits, cinnamon stick, and dates. The freshness is remarkable, and the depth and length makes this contemplative sipper a treat for enjoying after a good meal. The Fine Ruby Port is a young and delicious example of the ‘Ruby Style’ in the region, from the Vieira de Sousa estate. Spending no time in wooden vats, the approach for Ruby Ports is meant to focus on the intensity of fruit, rather than the play with oxygen that Tawny styles are known for. This is a very traditional blend of Touriga Nacional, Touriga Francesa (Franca), Tinto Cão, Tinta Roriz, where the hand-harvested fruit was brought into the cellar for a foot-treading press in old granite lagares. It ferments in lagares until it reaches the desired Baumé, (in this case 3.2). It was then fortified with Brandy to keep the sugar level and fruit flavor vivid and rich, offering delicious aromas and flavors of red fruit and plums, a decadent mouthfeel, and soft tannins. Once open, drink this wine within several days, as it is about the fruit, not the oxygen. The 2011 Vintage Port is a powerful and classic example of what was arguably one of the greatest Port vintages in several decades. With plenty of rain through the winter and spring to help the grapes sustain the warm summer and a very hot August, maturation was perfect for the grapes to stand alone in a vintage bottling. Hand-harvested fruit was brought in to the cellar for an old-fashioned foot crushing into large concrete lagares to begin natural fermentation. When halted by fortification with grape brandy, the wine was then aged for three years in stainless steel before being bottled. Like vintage Port always promises, this wine is robust and concentrated, while having compact precision and amazing elegance on the palate. Inky in color with brambly black fruits and spice in the nose and mouth, this Port will be incredibly long-lived, and is an over-sized chair and fireplace’s best friend.